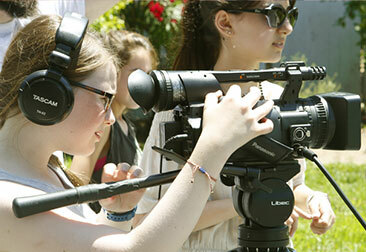 In our hands-on 12-Weekend Filmmaking Camp, kids learn to make their own movies during the school year. To gain as much experience as possible, campers write, direct, and edit their own short films while rotating through different crew positions in their classmates’ projects. From day one, kids work with digital cameras to learn the fundamentals of filmmaking in the most effective way possible — by making films! Classes in directing, writing, editing, cinematography, and production teach creative and technical aspects of visual storytelling. Los Angeles campers can shoot their films on the Universal Studios backlot, while New York City campers can shoot both in our professional facilities and on supervised trips out into the city. A special screening for friends and family celebrates final film projects, and students complete camp with a NYFA certificate and a copy of their work. In this challenging camp, returning campers create a longer and more complex project, paying close attention to set and costume design, locations, shot choices and coverage, and crew roles. Classes focus on digital cinematography, screenwriting, editing practice and aesthetics, and directing. The finished product is a film of up to five minutes.